With all the bad news we have to endure these days, it's nice to report on something edifying and positive from time to time. I'm a mother of ten children, ages 3 to 12. When my firstborn children were very young, my husband and I were concerned about finding a way to have them confirmed early. My archdiocese – Indianapolis – was confirming children in the 11th grade. Now it's the ninth grade, but still unacceptable to us as parents who want the best for our children's souls. We wanted our children to get the graces from the sacrament while they were still innocent enough to be more efficacious. (I hope they will still be innocent as adults!) I was confirmed in the fifth grade in Quebec, Canada. I had no idea how to go about getting early Confirmation or if it was even possible. 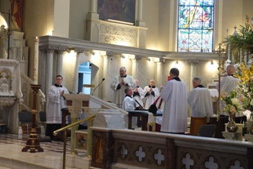 I discovered the Latin Mass in my early adulthood and attended occasionally. Some years ago, my husband finally agreed to try to attend. He did not feel like he could follow the Mass at first, and felt lost. We also discovered the Una Voce group at our parish, which was one state over, but only 30 minutes from our home. During some of our meetings I found out about the extraordinary form (EF) Confirmation, which was being held at select parishes around the country. 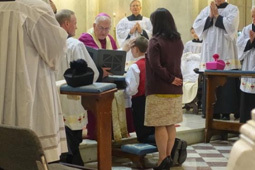 One mother was actively seeking to get EF Confirmation for her son at our parish but had little success, although the pastor, a canon lawyer, seemed very interested. Perhaps it was not the right time, but he said he would look into it. Several years passed with no real progress, or so we thought. I started to ask our pastor as well. We got the same answer: that he was looking into it, and that he would be interested. Finally, my friend said: 'We should get a man to ask!' So my husband did, and lo and behold, we got the affirmative – our pastor would seek permission from Archbishop Kurtz of Louisville. I was almost sure the archbishop would say no. Sometime later, I asked our priest again, and he said that the archbishop wanted to do it and was excited about the idea! We were thrilled! I waited a few weeks (so as not to appear too pushy) and asked our priest if children "Holy Communion age" and up would be eligible, and to my great joy, he said yes. Wow! Could it be that my oldest seven children would soon receive Confirmation and First Holy Communion? I put off until the very last moment finding out whether those who would just be receiving First Holy Communion could also receive Confirmation at the same Mass. Our priest said yes; he didn't even blink an eye over it. We had over 50 confirmandi and their sponsors, and family besides. It was a big event in more ways than one. It is probably the first time in 50 or so years that Confirmation has been celebrated in the extraordinary form in Louisville. Many of the families I approached before we got permission for ours had travelled far and wide to have their children confirmed over the years. The day arrived, and it was just heavenly! Everything seemed to go off without a hitch. It was all so beautiful: a great Mother's Day for me, and a great day for our parish, our children, and the adults who were confirmed. Thank you, Jesus and Mary, Father Paul Beach and Archbishop Kurtz!